Chanh promotes his ‘panacea’ on bus No.12 on the morning of November 7, 2016. Muggers posing as passengers have been terrorizing buses in southern Vietnam for years, seemingly above the law as authorities seem unable to shut them down. 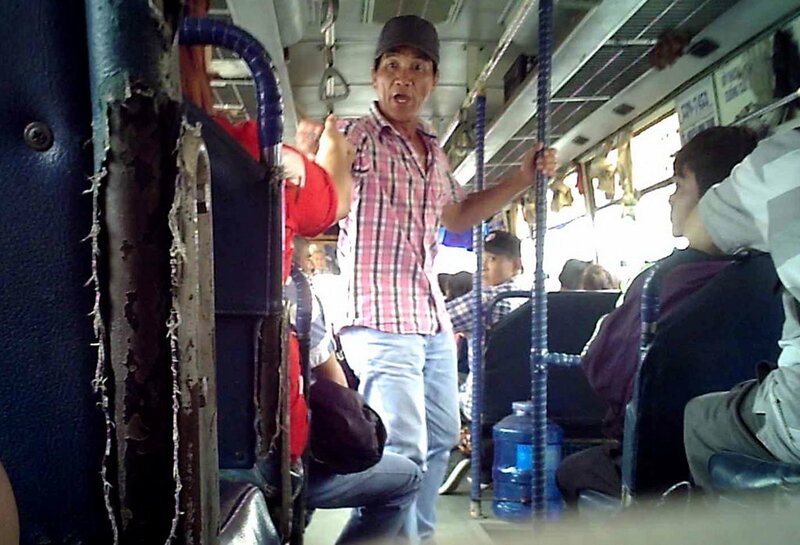 The thugs, who often act as merchants of 'panacea,' target buses traveling from Ho Chi Minh City to neighboring provinces, on which they manipulate and threaten passengers to buy their products. The bandits operate in gangs, with a man named Cuong considered the mastermind, with decades of experience and generations of ‘disciples’ in his portfolio. Several of Cuong’s mentees have gone on to form their own gangs. Born in the south-central city of Nha Trang, Cuong moved to Ho Chi Minh City and began his panacea endeavors near the Binh Phuoc flyover in Thu Duc District, able to acquaint himself with some notorious gang leaders in the area. In order to keep himself off the radar of local authorities, Cuong is now residing in a tenanted room in the southern province of Dong Nai, which costs him some VND600,000 (US$26.3) a month. His gang often preys on bus No.12, which shuttles between Ho Chi Minh City and Dong Nai on a daily basis. According to the ‘master,’ one has to dress and talk properly to be a persuasive seller, while his presentation has to follow a certain process. “You have to introduce yourself as an employee of a reputable pharmacy before handing out pieces of paper with a prescription able to cure many diseases,” Cuong said. The prescriptions are then given for free to earn the trust of passengers, he continued, adding that the real trick begins when the targets receive the medicine. A blister pack of PIROMAX, a type of pain killer selling for VND3,000 ($0.13), would be charged at hundreds of thousands of dong (VND100,000 = $4.3). “People who receive the medicine but refuse to pay will be taught a lesson. Those who have anything to say about our business will also suffer the same fate,” Cuong asserted. The mastermind has also taught his apprentices knowledge of the law, reminding them to only dole out soft-tissue wounds, as inflicting more serious injuries would lead to a criminal charge. Such gangs have been detained by police officers on several occasions, Cuong recalled, adding that they were only warned as there was no evidence. Aside from Cuong’s group, other teams of dishonest ‘businessmen’ operate in the area and respect each other’s territory. Chanh’s gang is the most notorious, with a large number of young and intimidating members, becoming a nightmare for bus passengers traveling from Ho Chi Minh City to other locations. Besides targeting intercity shuttle buses, the crooks also carry out raids on coaches of local passenger bus lines and cooperatives. “You have to pull over following their signal. They will break the windows and prevent you from picking up any passenger if you refuse to cooperate,” one passenger bus driver said. A probe showed that Chanh’s group could earn VND5 million ($219.6) per day from their illegal practice. No witnesses or bus operators have dared to stand up to the outlaws for fear of falling victim to an act of revenge. According to Nguyen Than Tai, an official of the Dong Nai Department of Transport, it is difficult to permanently dealt with the muggers as victims have refused to provide evidence against them. “Several officers have been attacked during their inspections. Bus operators who prohibit the sale of their medicine have been harassed and obstructed from running their service,” Tai said. Tran Ba Hoa, president of a transport cooperative whose buses have been targeted by the criminal gangs, said that he could only warn his passengers of the potential danger, reminding them to pay extra attention to their belongings during trips. Nguyen Van Tri, vice-president of another cooperative, said that bus passenger numbers have dropped because of the issue, affecting his business. “The authorities must find a permanent solution to this problem,” Tri said. Cuong (in white shirt) threatens and assauts a passenger on a bus on November 3, 2016.